I’ve argued that LOD is inefficient, and many of my readers seem to agree. It leads to model overload yet still often misses the mark on real-life information needs. The ‘GR’ approach solves those issues. The idea is to categorize the graphical representation of BIM objects based on their intended use. That lets actors request, create and get just the right amount of detail every time. It’s very different from accumulating data based on lists in general LOD standards. And it’s actually quite simple. If you’re going to use the 3D model to make a component, then –and only then!– do you need fully detailed geometry. It could be a solid element like a beam or a rebar, or it could be an assembly, like a wall panel, truss or reinforcing cage. 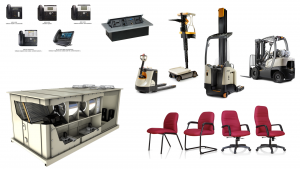 CNC machines and factories need full details for precise production. 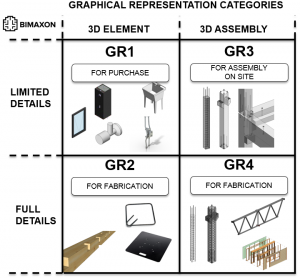 This corresponds to the GR2 and GR4 categories: BIM objects for fabrication. If you’re going to buy a component, there’s limited need for detail in its model, probably just the external dimensions, for clash detection, and any connections. It could be a window, a sink or an AHU, brick mass or metal connectors. Don’t add more detail – “designing” what’s already designed and produced is a waste of time and IT resources. This is the GR1 category: BIM objects for purchase. If you’re going to assemble a component on site, its BIM object will just need enough detail for proper assembly. It could be a column, for instance, comprising concrete of precise dimensions, a prefabricated reinforcing cage, and connection details purchased ready-to-use. We can give each element just the level of detailing needed, not requiring the entire assembly to meet a certain LOD. 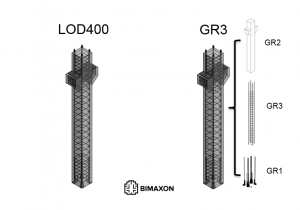 This is the GR3 category: groups of BIM objects with diverse detailing needs for assembly on site. As a property of a BIM element or assembly, the GR category thus denotes the level of detailing in the 3D model of the building component. It does so more simply and flexibly than an LOD level. LOD doesn’t distinguish well the real needs for specific uses and actors. It requires designers to include unnecessary information in models – especially for ready-to-use items I’ll buy and for assemblies. You can easily filter the components you expect to buy (GR1); those you’ll cut, mill, drill, cast or 3D print (GR2); those you plan to assemble on site (GR3); and those you’ll have made at a factory (GR4). As noted previously, a key benefit of the GR approach over LOD is it avoids an attitude of rote progression and unthinking accumulation of data. That perhaps will need more explanation, as will the perfect fit of GR categories with the set-of-information approach to BIM data management.